TORONTO - Ontario consumers could see major changes to the way beer, wine and spirits are sold if the Liberal government adopts the recommendations of an advisory panel it set up to find ways of squeezing more value out of Crown assets. The panel chaired by Ed Clark of TD Bank Group looked at possible sales of Ontario Power Generation, Hydro One and the Liquor Control Board, but in its interim report released Thursday concluded all three should remain in public hands. "Ontario can retain all three core companies and significantly improve their performance," Clark said in the forward to the report. However, the panel recommended sweeping changes to improve sales and profits at the government-owned LCBO, which turns over a dividend of about $1.7 billion a year to the province on top of taxes. 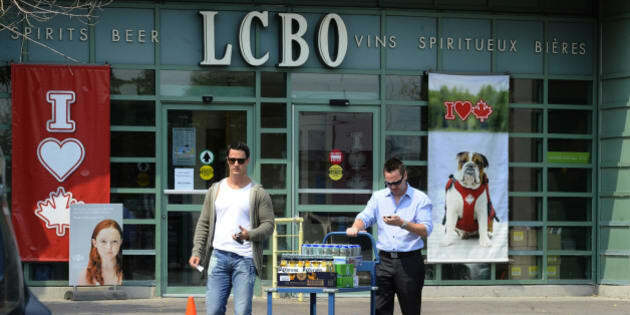 It said the LCBO should move to a 'click and collect' model to allow customers to buy booze online — including products from around the world — and be able to pick their purchases up at the local liquor store. It recommended LCBO stores be allowed to sell 12-packs of beer, not just six-packs, and said the agency should increase its service charge for beer for the first time since 1989, noting beer prices jumped 64 per cent during that time. The panel said the Liberals should negotiate new deals with the foreign-owned Beer Store, which has 447 retail outlets, and with Winery Retail stores, which are owned by six wineries that sell only their own products at 292 off-site stores and 199 on-site outlets. "We do not believe as a matter of principle that the government should continue to foster a marketplace that provides unique benefits to these privately owned quasi-monopolies," concluded the panel. It said the Beer Store should give Ontario taxpayers get a "fair share of the profits" in exchange for its virtual monopoly on beer sales, and consumers should not see a price increase as a result. Clark rejected claims that the Beer Store can't afford to give taxpayers a slice of their profits. "What you're really saying is that this franchise you have is worthless, so would you then give it up," he said in a conference call. "They don't want to give it up but they don't want to pay for it, and we don't think that's a reasonable position." Canada's National Brewers, which represents Labatt, Molson and Sleeman, has warned the panel's ideas would add about $5 to the price of a case of 24. The panel also said Ontario should consider a limited number of stores featuring local and international craft beers and ciders, and do the same with the wine industry and distillers to generate some limited competition for the LCBO. "If you want to open a scotch store and have scotches from around the world, I don't believe that's going to bring down the LCBO monopoly," said Clark. On the electrical utilities, the panel recommended the province keep most of the operations in public hands, but said Hydro One should get out of the local distribution business and focus on its core transmission business. "The system needs more capital, which is unlikely to be available from the public sector owners given other pressing needs," said the report. However, the New Democrats said any time more privatization is introduced into Ontario's electricity sector, rates go up. "It's disappointing that Mr. Clark continues to pound that drum about selling off the distribution assets at Hydro One," said NDP Leader Andrea Horwath. "I don't hear people saying they want to pay more for hydro, but that's exactly what this move is going to do, and it's wrong headed." The Progressive Conservatives said Clark's report was a clear sign that the Liberal government won't make the "tough decisions" to rein in spending. "This is tiny money compared to the $12.5 billion deficit," said PC finance critic Vic Fedeli. "We're talking about a massive issue and they're talking about 12-packs in a liquor store." The panel said its proposals would help limit the growth in electricity rates, keep liquor prices below the Canadian average and free up as much as $3 billion _ mostly from the Hydro One sale of a portion of its distribution business _ money the Liberals promise to spend on infrastructure projects, not to lower the deficit. The government said it would review the panel's suggestions in the interim report released Thursday and consider its final report, which is due before the spring budget. "The government agrees with the council's initial proposals," Finance Minister Charles Sousa said in a release. "Its activities and recommendations will help inform the province's 2015 Budget process."